After their unexpected double victory in the 74th Hunger Games, District 12 tributes Katniss (Jennifer Lawrence) and Peeta (Josh Hutcherson) have become the darlings of the Capitol. But not everyone is convinced that Katniss’ act with the berries was a gesture of love and not one of treason. Unrest is brewing in the districts, and President Snow (Donald Sutherland) will do anything to stop it from spreading. Together with the Machiavellian new head game maker, Plutarch Heavensbee (Philip Seymour Hoffman), he plots the next edition of Hunger Games, an event that will destroy Katniss and her image once and for all. 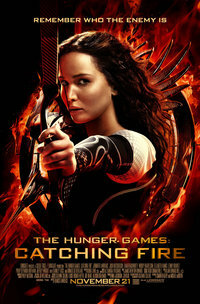 Catching Fire is quintessential “smart entertainment”: fast paced and thought provoking. An action blockbuster with a female lead, the film has also generated appraisal for the portrayal of its heroine. Katniss is a nuanced character; as she becomes the symbol of the rebellion she feels at once exhilarated and uneasy with her status as the Mockingjay. Catching Fire skillfully explores the growing disparity between Katniss as individual and Katniss as image, and this aspect of the film is something I intend to explore in greater depth in the Alternate Take. The appeal of its lead is not to be overlooked as it is Lawrence who is largely responsible for the film’s magnetism and charm. She is both tough and vulnerable at the same time, and above all disarmingly authentic. The film draws on the star’s recent rise to prominence, paralleling the sass of Katniss’ star persona with Lawrence’s own. The supporting cast is equally strong: Hutcherson’s Peeta is touching - rather than, as previously, merely dogged - in his portrayal of unrequited love. Elizabeth Banks is wonderful as Effie Trinket, veering between the vacuous vanity of the Capitol and her heartfelt attachment to her tributes. The newcomers - notably Sam Claflin as the suave Finnick Odair and Jena Malone as the feisty Johanna Mason - bring their characters to life with grace and gravitas, drawing out the turmoil underneath the almost parodic surfaces of the former victors. There are, however, moments in which the film seems altogether too sleek. Even if the first part were considered a mess of a movie, it is a heartfelt mess. In contrast, Catching Fire often seems like an exposition for Mockingjay; the withholding of information appears heavy handed, and the cliffhanger ending is far from satisfying. This is perhaps due to the film’s requirement to balance a range of different audience expectations. While it is sure to please the enthusiasts of the books, will Catching Fire inspire newcomers to the series? At its strongest the film is at once breathtaking, smart and terrifying, and, judging from the box office, the odds certainly seem to be in its favour. This review was published on December 12, 2013.